The Peace of Basel of 1795 consists of three peace treaties involving France (represented by François de Barthélemy). France made peace with Prussia (represented by Karl August von Hardenberg) on 5 April; with Spain (represented by Domingo d'Yriarte) on 22 July, ending the War of the Pyrenees; and with Hessen-Kassel (Hesse-Cassel) (represented by Friedrich Sigismund Waitz von Eschen) on 28 August, concluding the stage of the French Revolutionary Wars against the First Coalition. The effect was the emergence of revolutionary France as a major European power. 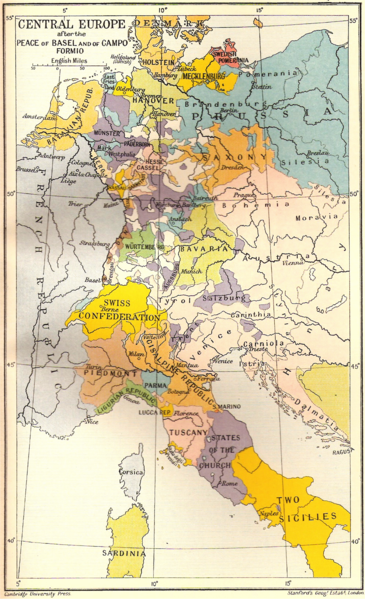 Prussia recognized French control of the west bank of Rhine, pending a cession by the Imperial Diet, while France returned all of the lands east of the Rhine captured during the war. Spain ceded the eastern two-thirds of the island of Hispaniola to France.